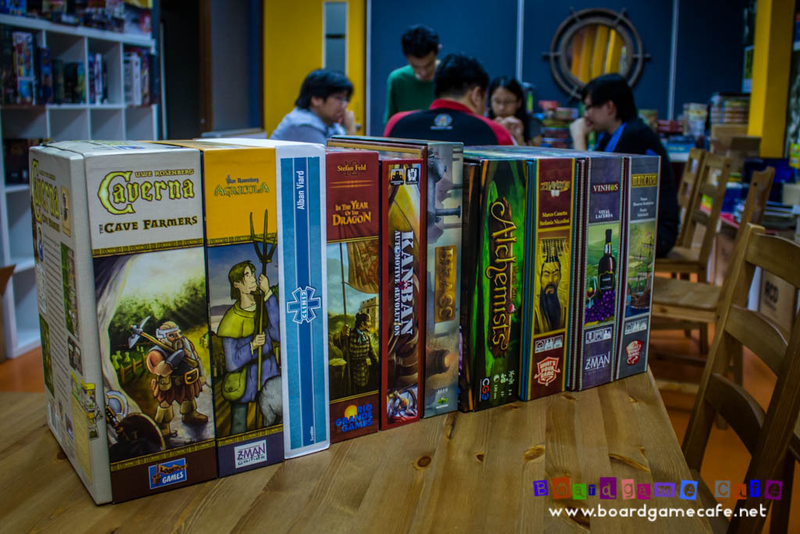 Most of us boardgamers would have heard of the Rahdo Runs Through video series of game reviews. A lot of us probably base our buying (or playing) decisions on the run-through sessions posted by Rahdo. Recently Rahdo posted a video listing his Top 10 Heaviest Games and we OTKers thought it would be interesting to base our Friday Meetups on those ten games. 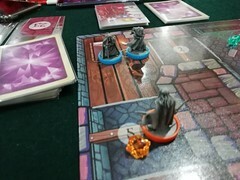 There were two slight issues – i) we do not have all the ten games (we do not have ATHLAS) and ii) it’s probably too much to expect the Friday OTK group to play thru all ten games in a single Friday session even though we play from 9 pm till 4 am. We made the first issue a non-issue by simply skipping the game we do not have (which is ATHLAS); after all 9 heavy games are still good for our theme nite. As for the 2nd issue, though we might not be able to do all 9 games in one session, we could possibly cover them in two Friday sessions. 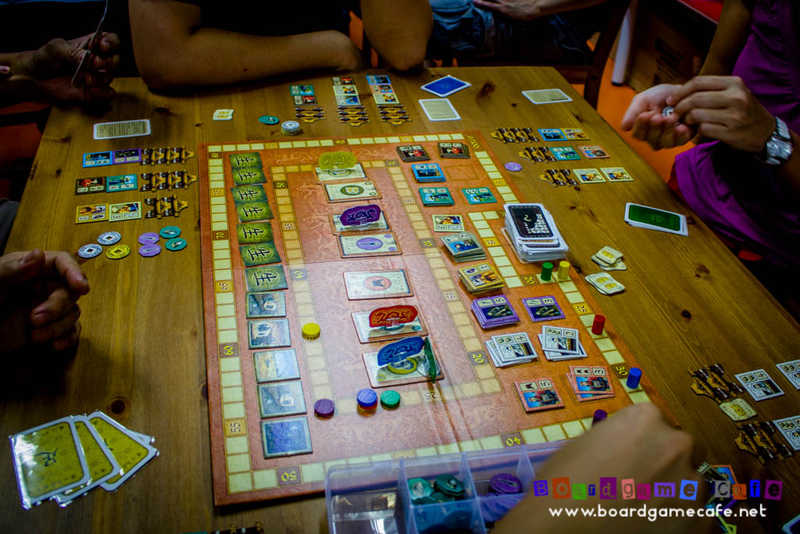 Instead of playing thru the list sequentially, we split it based on odd/even basis which meant we’ll cover the following games in the first Friday session (which is this report) – Agricola, In the Year of the Dragon, Brass, Zhanguo, Vinhos. 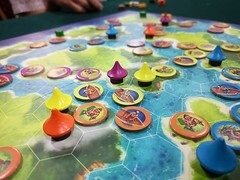 And next Friday, we shall look forward to playing Clinic, Kanban, Alchemists, and Madeira. Let’s take a look at how the first session went. 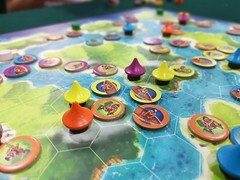 The first game to hit the table was Stefan Feld’s IN THE YEAR OF THE DRAGON as that table has a 5-player count and most of them had not played ItYotD before. 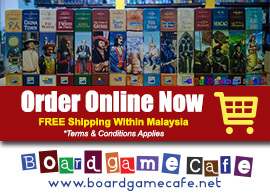 It’s a pity this game is now out-of-print as it’s my fave Stefan Feld games (beside Castles of Burgundy). I always find the sequence of events in the Event Track should drive your strategy instead of sticking to a Double Privilege or Scholar approach. 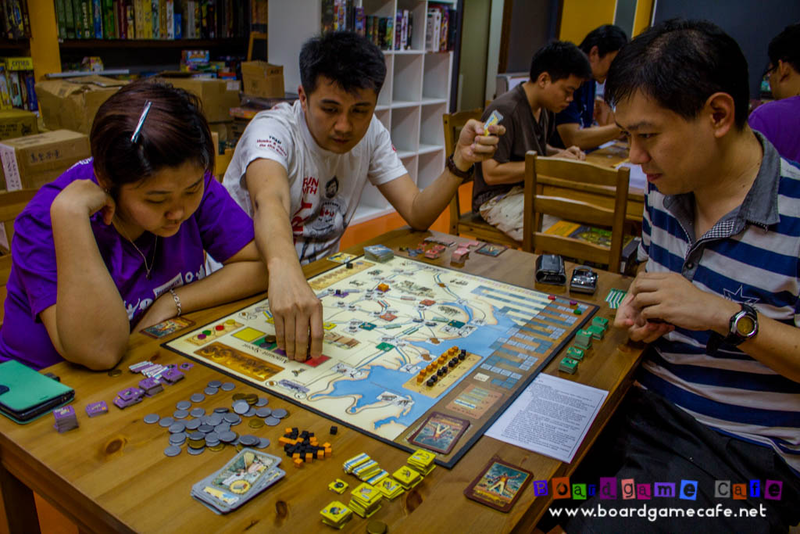 The 2nd table featured Martin Wallace’s BRASS, one of the early Euros I’d the chance to play back in the early days of Eurogaming in M’sia. Even though I felt AGE OF INDUSTRY offers some interesting streamlined improvements over BRASS, there’s still that magic feeling whenever we re-visit the Lancashire of BRASS. 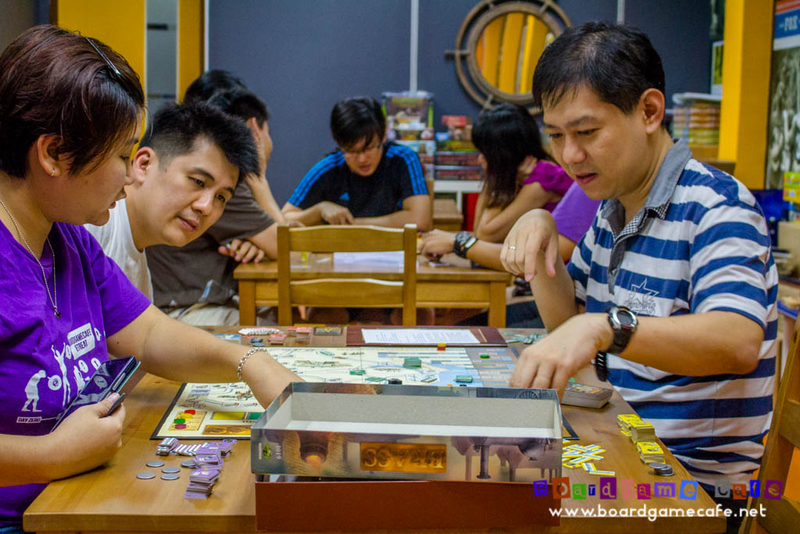 There was only one newbie (of BRASS) in this game ie Leafeny (lady on the left) and she’s stacked up against three veterans of this game (Allen, Hiew and CK). 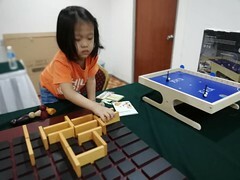 Leafeny joined our BGC Boardgame Retreat in Dec last year and since then she’s a semi-regular to our Friday OTK Meetups and have picked up many a heavy game. Bravo! 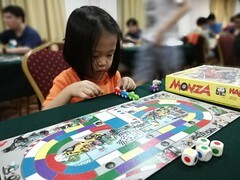 Interestingly Leafeny – as the start player – made her first move by dropping a coal mine into Oldham. An inconspicuous move, most would say. 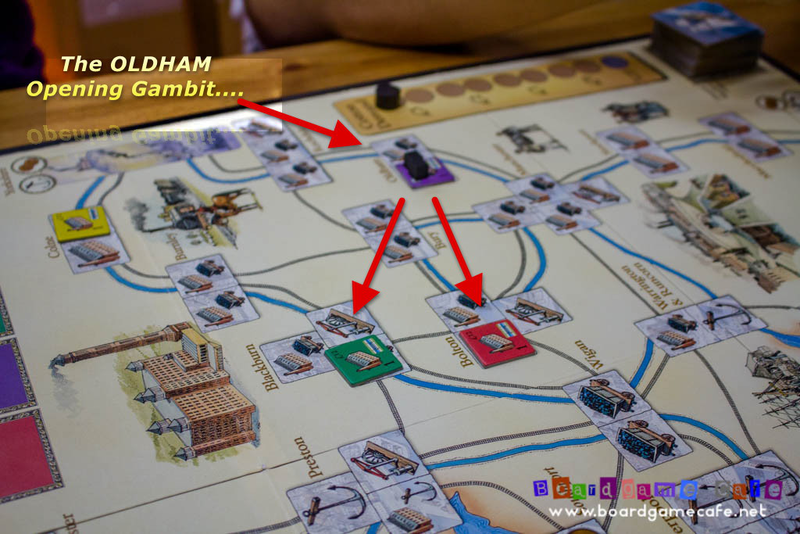 However in our session, this move turned into what is now known as the “Oldham Opening Gambit” and it rattled the veterans so much so two of us dropped a cotton mill into Blackburn & Bolton. I shall leave it to you readers to discover what’s the “oops” moment in both the Blackburn & Bolton moves (pic above). tsk tsk. There are two reasons I still favor BRASS over the newer AGE OF INDUSTRY. Firstly it’s the distinction between coal mines (black cubes) and iron works (orange cubes). Both of them played differently and your choice of going with coal or iron changes how you play BRASS. In AGE OF INDUSTRY, they are almost identical and it doesn’t really matter if you went for coal or iron (in AOI). 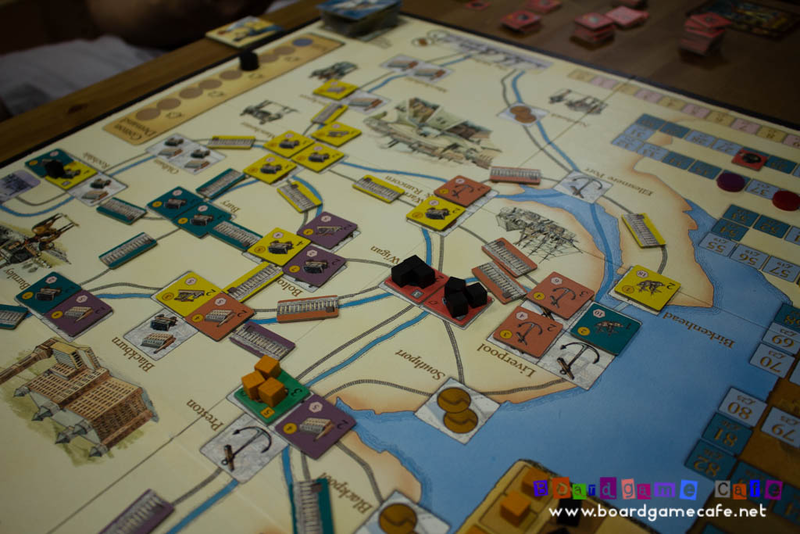 The 2nd reason is having two phases to the game in BRASS; the Canal period (where only canal can be built to link the industries) and the Rail period in the 2nd half of the game where railways can now be used to accelerate the development of Lancashire. 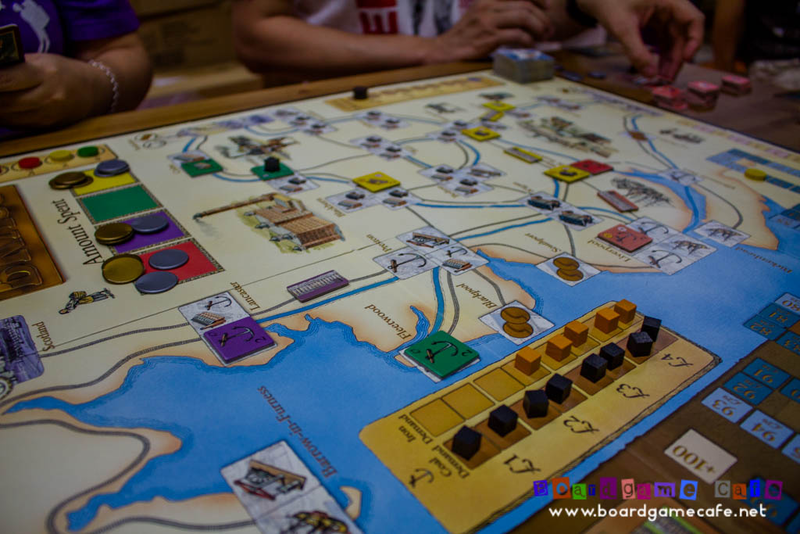 The two periods are interlocked, and how well you will do in the Rail period depends very much on how you set up shop during the Canal period. 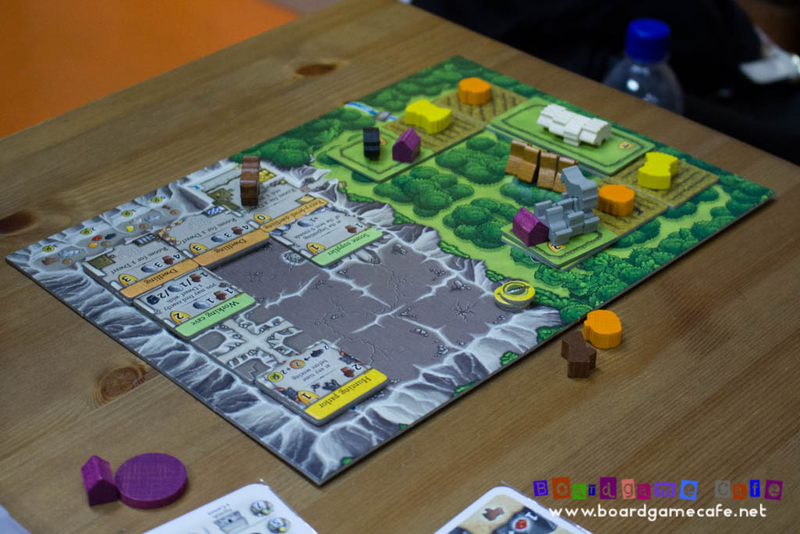 AGRICOLA is named in Rahdo’s Top Ten list and one of the tables were going to get started with a 4p Agricola session only to have a 5th player joining and after some discussion, decided to go with CAVERNA instead. 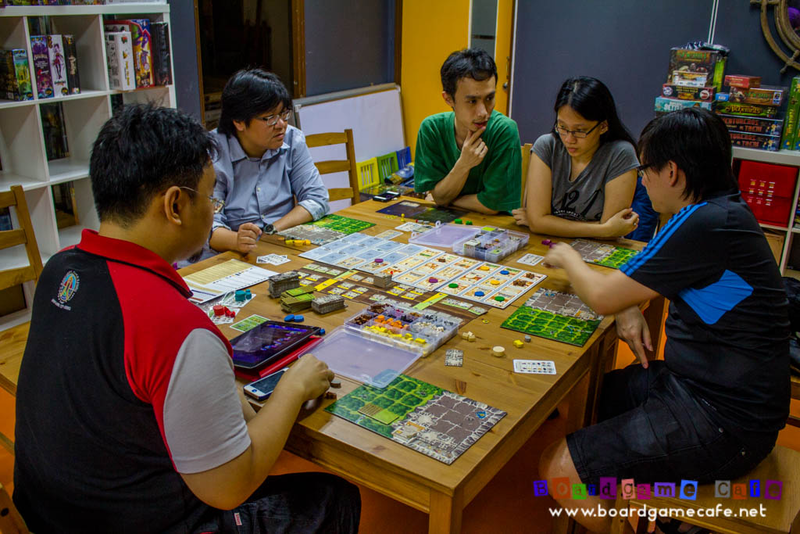 Five player CAVERNA in session….. as a stand-in for AGRICOLA in Rahdo’s Top Ten Heaviest Games theme nite at OTK Cheras. CAVERNA has a game board that looks just as busy as Agricola. 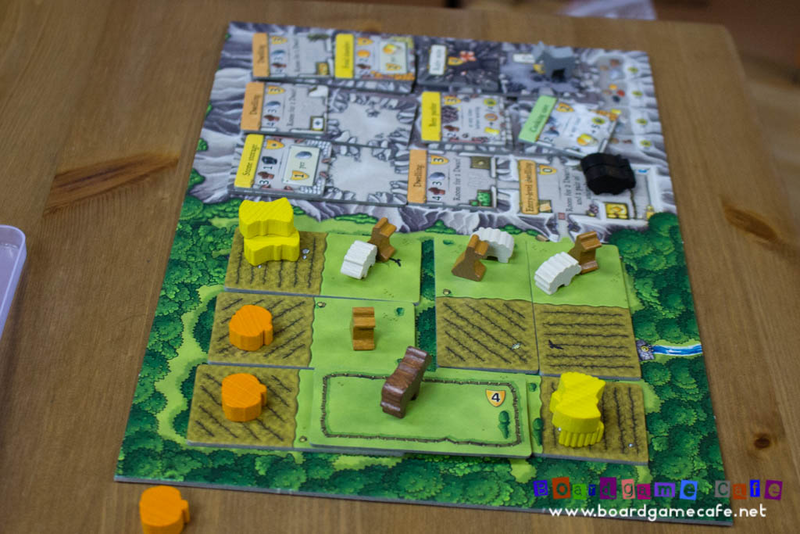 I actually think Caverna’s board is busier than Agri. I find the end-game farms in Caverna are usually more diversified than Agricola’s and here are some pics of the farms at the end of this Caverna session for your perusal. Above: Clearly a farmer here…. Above: This gamer loves his/her trees! 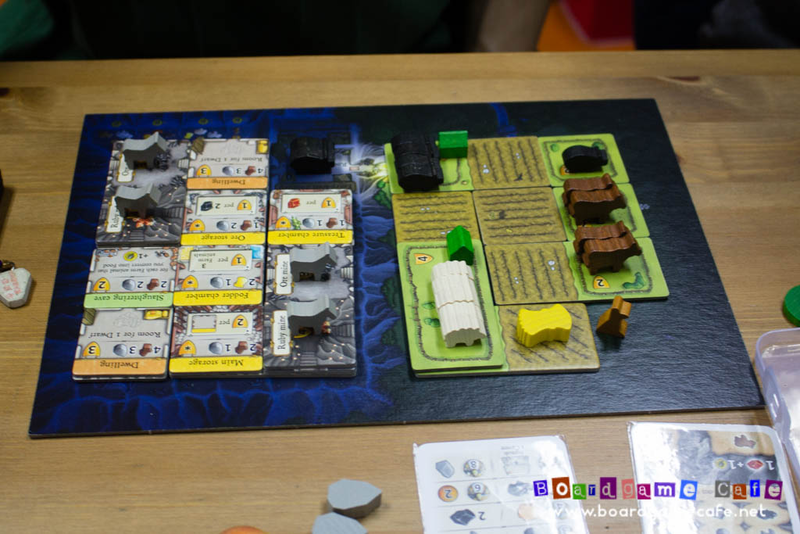 Above: The contrast of black makes for a very beautiful looking farm board. 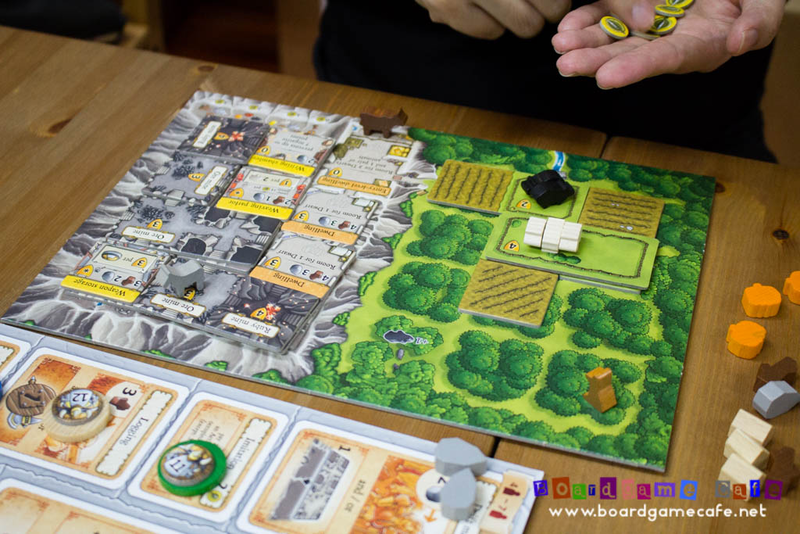 There’s a certain appeal to CAVERNA that makes it stand out from AGRICOLA, and as you can see from the farms above, almost all of them were unique in their own ways which allows the gamers to forge their own path. 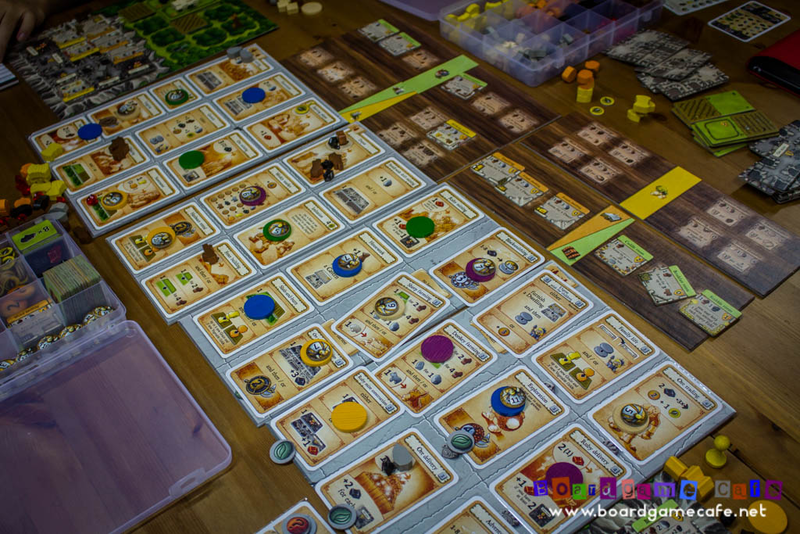 While we’ve not yet done it with 6- or 7-players, we do find CAVERNA a sweet game for 4-5 players. 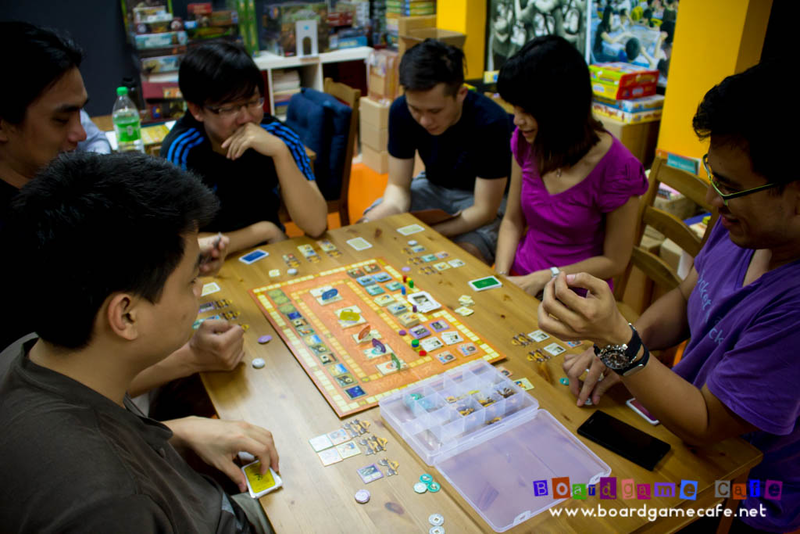 Perhaps we should do an UWE ROSENBERG theme nite and have Agricola, Caverna, Gates of Loyang and even Bohnanza all in play! 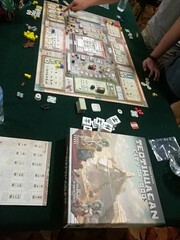 It was getting close to 4 am when the CAVERNA session ended and while a few gamers would like to stay and continue with ZHANGUO, we decided 3 out of the 5 heavies done was good enough and decided to call it a night. Above: The list of Top Ten Heaviest Games (from Rahdo Runs Through) that we are playing thru this week and next. 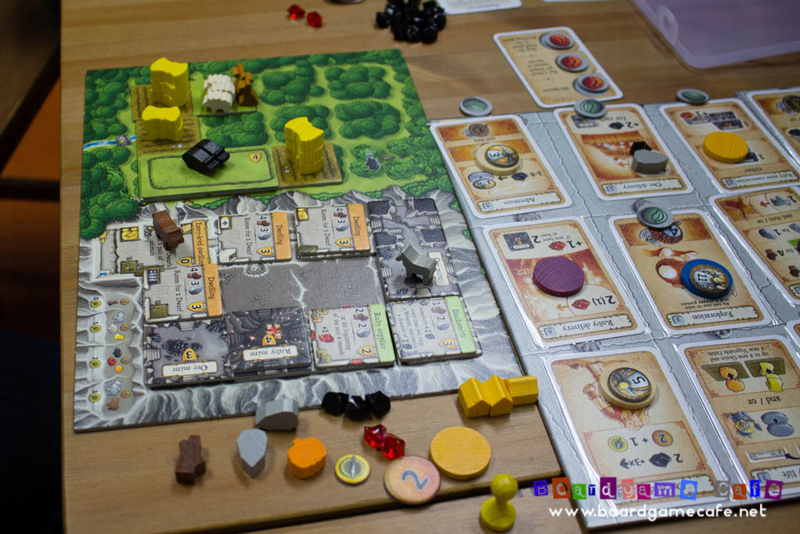 Caverna was added as a stand-in for Agricola. Next week, we’ll be doing the odd series ie. Clinic, Kanban, Alchemists and Madeira.